THE farming community now has the opportunity to trial new potato varieties after the National Agricultural Research Institute (NARI) officially made a preliminary release of two varieties resistant to the late blight. The varieties referred to as NP1 and NP2 (NP stands for NARI potato) were pre-released during the agricultural innovations show early this month along with a broiler feeding system and two cold-tolerant rice varieties for the highlands. The preliminary release of the two varieties will be sigh of relieve to smallholder farmers who have been unable to grow the crop after it was completely wiped out by the potato late blight (PLB) disease in March 2003. The potato industry worth about K25 million at that time has not recovered fully as the common variety Sequoia is still very susceptible to PLB. After the outbreak caused by a fungal agent, Phytophthora infestans, the Sequoia variety could not be grown by ordinary farmers due to the cost of weekly fungicide treatments. The Sequoia is highly susceptible to the late blight and potato production has been limited to a relatively small number of commercial farmers who could afford chemicals, backpack sprayers and seed potato. Subsistence farmers, particularly in the highlands where the crop is usually grown rely on potato as an important crop. Potato is not only a commercial crop but is also a source of food next to sweet potato (kaukau), particularly in the high altitude highlands where the choice of staple food is limited. In a view to revive the industry, particularly the smallholder farmers in mind, NARI initiated a project in 2003 with funding support from the Australian Centre for International Agricultural Research to evaluate blight resistant varieties. The objectives of the project were to introduce, multiply, evaluate and deploy late blight resistant clonal material into PNG and to develop safe, cost effective integrated late blight management strategies for existing and new potato cultivars and ultimately to rehabilitate potato production for smallholders. Under the project, NARI sourced 59 International Potato Centre (CIP) clones in 2003 and evaluation work has been undertaken at various sites to asses late blight resistant and yield. Of the 59 clones, 12 clones where selected and further evaluated against Sequoia both on station and on-farm. The two varieties pre-released have proven to be late blight-resistant, high yielding and have other favorable agronomic traits such as good taste and processing quality. These were observed through on-farm farmer participatory trials covering some 15 sites over three seasons in Enga, Western Highlands, Simbu, Eastern Highlands and Morobe (Kabwum) provinces. The pre-released varieties have been subjected to a wide range of farmers and general public for their comments and views, both at the growing and harvesting stages. Many farmers have already shown their approval and are into growing them, including seed production. The Enga rural potato project based in the Lagaip-Pogera district, an initiative of its local Member of Parliament has ventured into seed production with a view to reviving the crop in the district and the province as a whole. This is seen as a good initiative as the adoption of new potato varieties by farmers depends on the availability of a consistent supply of quality seed potatoes. The late blight disease remains a concern to the potato farmers, especially in the highlands where the crop is popular and usually grown. The fungus is a specialised pathogen of potato and is an extremely-destructive disease of potatoes. It attacks both tubers and foliage at any stage of development and is capable of rapid development and spread. It was responsible for the devastating Irish potato famine of the 1840s and has continued to be important to the present. Since the Irish famine, late blight became the most-studied potato disease in the world. Previously free of the disease, PNG was one of the world's few remaining safe havens for growing potato until 2003. 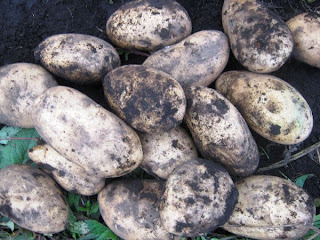 The entire potato crop was wiped out in a matter of weeks after it was first discovered in the Sirunki area of the Enga province leaving a trail of destruction. The blight is believed to have come across from the neighboring Indonesian province of Irian Jaya. Yield losses caused many smallholders, who relied on potato as a valuable cash and food crop, to withdraw from production, leading to an increase in potato prices in the country. Some breakthrough has been made to control PLB using fungicides, however, the extra input has been a burden to smallholder growers and identifying suitable varieties was the long lasting solution to revive the potato industry. NARI with support from other partners have taken on this responsibility and the preliminary release of the two varieties is an outcome of the efforts to assist smallholder growers and to reviving the once-thriving industry. It is now hoped that smallholder farmers will now be able grow their favourite crop once again with the preliminary released materials as additional inputs requirements associated with the Sequoia variety has denied them. The preliminary release of the blight resistant varieties is a breakthrough against the devastating potato disease and it is now up to the farming community to try the varieties in their farms and adopt them from their own judgments. 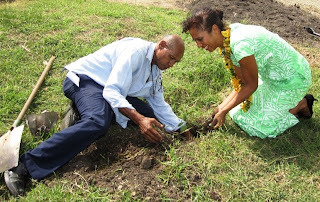 Tubusereia Primary School teacher Michael Tau was more than happy to get himself dirty while assisting PNG environment goodwill ambassador and Miss PNG Rachel Sapery James plant a mangrove seedling, The National reports. PACIFIC countries in the Pacific, African Carib- bean Pacific (ACP) group are ready to join PNG and Fiji in signing the economic partnership agreement (EPA) with the European Union (EU), The National reports. Pacific ACP countries have again stressed their commitments to conclude negotiations on EPA with the EU by the end of the year, as reported by Solomon Star newspaper yesterday. “However, that deadline could only be achieved, if there was flexibility from both sides,” the Pacific lead spokesperson on EPA negotiations and Tonga’s minister for trade, Lisiate Akolo said. The deadline for negotiations was December 2007 but the Pacific region failed to meet the timeline because it was not able to strike an acceptable free trade deal with the EU. Instead, Fiji and PNG signed interim EPAs with the EU in 2009. “I am pleased to inform you that interim agreement was ratified by the PNG parliament last Wednesday and the implementation of the agreement is well advanced,” Akolo said in his progress report to the ACP’s 93rd session of the council of ministers meeting underway in Brussels, Belgium. After seven years of negotiating the EPA the region seeks to bring negotiations to a conclusion. “We believe the region is now prepared and ready to do this. “A recent meeting of Pacific ACP in Apia, Samoa, and ministers agreed that this would be the overarching priority for the region in 2011. “But any conclusion will require all parties to show flexibility and be mutually committed to undertaking the work necessary to conclude the agreement,” Akolo said. He said the rest of the 12 Pacific ACP countries reaffirmed their desire to conclude a comprehensive EPA as a single region. The Pacific ACP EPA 2011 Strategy was adopted by trade ministers in Samoa, which outlined a work programme for the conclusion of the EPA. For PNG, Foreign Affairs and Trade Minister Don Polye has completed their agreement with his EU counterpart in March. CLASSES at the Mt Diamond Adventist Secondary School in Central have been suspended following the brutal killing of a student, The National reports. The Grade 10 male student, who was not named, was hacked to death in his sleep early on Sunday morning. Central provincial education board chairman Titus Romano Hatagen said yesterday the student was attacked by a group of men on the verandah of his home, which is located along the road to the school. His body was chopped to pieces, Hatagen added. NCD metropolitan commander Supt Joseph Tondop confirmed the death yesterday but could not provide details. The central education division was also not able to provide further details about the circumstances leading to the student’s death. However, Hatagen said he had cancelled classes for three days until Thursday. “Due to safety reasons and fear among the staff and students, the provincial education board has approved cancellation of classes,” he said. He said the board expected students, who had left the school, to return tomorrow. Hatagen assured parents that police were investigating the killing and were closely monitoring developments in the surrounding communities. “I appeal to parents not to withdraw their children from the school and staff and students should not interfere with investigations,” he said. The Mt Diamond Adventist Secondary School principal could not be reached for comments. The boarding school is located in the Kairuku-Hiri electorate, inland from Tubusereia village, off the Magi Highway. SOUTH Bougainville police commander Paul Kamuai yesterday said a civilian was shot and wounded on Sunday evening at Mongai village in Konnou, South Bougainville, The National reports. Kamuai said Isaac Malabus, 24, of a mixed Muisuru and Mongai parentage, was recovering at Buka General Hospital after he was rushed to Buka from Buin at 3am yesterday. “Malabus went to Mongai to vi-sit his mother when he was confronted by five former Mekamui combatants who are now followers of former commander and gang leader Damien Koike,” he said. “The criminals ordered Malabus to sit down and questioned him on the whereabouts of freedom fighters in the area. “When he said he did not know anything, he was shot below the knee and stomach,” Kamuai said. He said tension among communities in the Konnou constituency was high. “Criminal elements do not normally go to Mongai because the area is known to have its own home guards. “The villagers are living in fear because the criminals crossed into Mongai territory deep in the night, searching for the village chief and his home guards,” Kamuai said. In a related incident, Kamuai reported Buin police had received reports that a former police scout was killed in Konnou last Wednesday. “Our local sources said the alleged murder occurred deep inside Koike’s territory, next to Siniminoi alluvial gold mine, Koike’s economic base,” Kamuai said. He said the victim was known to police because, during his time as a home guard at Mongai, he was a police scout helping the South Bougainville police. “In 2008, he was wounded by an AR15 at Mogoroi, got treated at the Buka hospital and, on discharge, went deep into Koike’s territory. “I cannot confirm if the former scout was killed,” Kamuai said. MILNE Bay provincial government last week started a special operation to remove all foreigners illegally working and living in the province, The National reports. Customs commissioner Gary Juffa, who was in the province for the start of the operation, said the exercise was targeting people who breached Papua New Guinea’s migration and labour laws. “The aim of the operation is to scrutinise foreign workers living and working in Milne Bay and also to ensure they comply with labour and migration laws,” he said. “Time and time again we hear and read of illegal foreign business and foreigners illegally living in and working in PNG,” Juffa said. “We must protect the interests of PNG and its people,” he said. The two-week operation was spearheaded by the provincial administration, customs, police and the office of labour and migration. Juffa commended the Milne Bay provincial administration for its initiative, saying customs would work closely with the administration to ensure the exercise was a success. He said a number of foreigners had already been deported from the province after they were found to be illegally working and living there. He said, so far, Milne Bay and East New Britain were the only provinces who were actually removing illegal foreigners and business working or operating there. While in the province, Juffa attended a gathering hosted by the Border Development Authority to discuss trans-boundary issues. Transparency International PNG is concerned with the state-sanctioned construction of the Kiunga-Hiritano Highway through immense tracts of Western province land covered by the controversial special purpose agriculture business leases (SABLs). Chairman of TIPNG Lawrence Stephens was commenting on the recent media reports of arrangements for construction of the Trans National Highway: "There is huge concern that the leases were improperly executed, that they will result in large-scale logging without providing large scale agricultural development and that the landowners are not adequately informed of the implications of these agreements supposedly executed on their behalf. "Now the reports suggest that the leaseholders are involved in arrangements to build a major national highway which will cost the government nothing. “The people of Western and Gulf provinces deserve to share in the prosperity of PNG. “More importantly they need to benefit from resources in these provinces. “A good road linking Kiunga to Port Moresby would be of great benefit to the people. “But how do we achieve this at no cost to government unless we are giving some people the right to large areas of timber resources which, before the SPABLs were issued, belonged to whole communities? Stephens raised the specific concern with reports that landowners have agreed to “trade off” their resources for access to roads in agreeing to a developer to harvest forest within the road corridors of the transnational highway. “What will happen to the prime virgin forest that the landowners are trading off? “Will all the landowners be fairly compensated by the developer not just a select few? “How wide is the corridor of tree harvesting along a 600km road? “Gulf and Western povince people have the right to know what is planned. “They are familiar with plans which see them lose their resources with no development to show for it." TI PNG, according to Stephens, remains concerned that “for too long our rural people based have not benefited from their resources and many unscrupulous developers have taken advantage of them. If this is to stop a true agricultural industry must be fostered, SABL's must not be a means for the bypassing of strict forestry regulations”. Stephens reiterated the need to immediately conduct the commission of inquiry into the SABLs so as to rectify any possible irregularities. 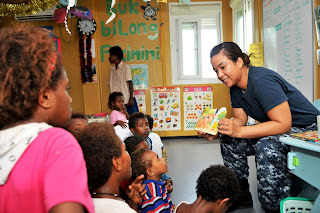 Hospital corpsman seaman Carmen Alfaro, assigned to the amphibious transport dock ship USS Cleveland (LPD7), reading to children during a Pacific Partnership civil action project in Lae, The National reports. Pacific Partnership is a five-month humanitarian assistance initiative that will also make port visits to Tonga, Vanuatu, Timor-Leste and Micronesia. OK Tedi Mining Ltd has temporarily suspended production at the Ok Tedi mine following concerns over a series of small ruptures in the company’s pyrite pipeline, The National reports. The pipeline, commissioned in 2008, transports pyrite concentrates 128km from the tailings processing plant at the mine, along the Tabubil-Kiunga highway and on to Bige to underwater storage pits. Four small ruptures occurred in some sections of the pipeline in the past weeks causing spillage in a localised area along the highway. FREE and universal basic education in the country will cost the government more than K17 billion over the next decade, Education Minister James Marape said during debate in parliament last Friday, The National reports. He said a cabinet meeting in Wabag last year decided on free education and that had been endorsed by the national executive council. Marape said as a responsible government, it had to consider other important sectors to make sure they did not stuff up "when a large chunk of money is injected into free education". New Ireland Governor Sir Julius Chan said education was a right, as stipulated under the United Nations charter, and the government should provide free education. "First and foremost is the future of the nation and, in order to have a literate society, the government should invest in education," he said. Sir Julius said none of the nation's wealth was going to the people and the only way was to give free education to children. "It is the best way to distribute wealth and it is best to invest in our human resources." He said through free education, "money will be put into the pockets of the people, which will then raise their standard of living". "It is time for the people to demand free education from their political representatives. "If they do not do that, then throw them out in the 2012 general election," Sir Julius said. He said if he could provide free education in his province, "there is no reason why the government cannot" do that. FORMER prime minister and New Ireland Governor Sir Julius Chan has bluntly told the people of Papua New Guinea to throw out their respective members of parliament in the 2012 general election if they are not willing to provide free education, The National reports. Sir Julius and his government have lead the way in providing free elementary and primary education through to Grade 8 since 2008, subsidising 75% of fees for Grades 9 to 12, providing K1,200 per year for all provincial students in tertiary institutions and providing four post-graduate scholarships at K50,000 per annum for specially selected faculties like mining engineering, environment, fisheries and agriculture. He told parliament last Friday that the people of PNG should demand the national government do what the province had already done and provide free education for all children. "The grassroots people of this country are hurting and the LNG project has done them no good – it has only forced the prices of rice, bread, tinned fish, rental and other costs to double and triple," he said. "The rich are getting richer and the poor are suffering." Sir Julius said if the government wanted to help the people of this country, "help the future of this country, they should provide free education now". He said free education not only ensure a bright future for children but it would put thousands of kina in the pockets of hard working mothers and fathers. Sir Julius said the government had talked about universal primary education for years, "but they have done nothing". "This is unforgiveable, look at the billions of kina of wealth coming out of 'mama and papa graun' and where does it go? "It should go, first and foremost, towards the future of our country, towards providing education for all our young people and towards putting some kina in the pockets of their mothers and fathers." He said his province spent K12 million every year for free education. "We constantly hear about how strong our economy is, about the 8% growth and about how great the LNG project is and about how much money we are earning from high gold and copper and oil prices. "But none of this seems to get to the people on the ground." Sir Julius said the people should demand that "government provide free elementary and primary education in the 2012 national budget, and that they extend this to at least 50% subsidised secondary education in the 2013 national budget". "It is time for the people to take control of their government. And it is very simple. Every NGO, every community-based organisation, every women's group, every village planning committee, ward development committee, LLG and province, every man and woman in this country should write, phone or talk to their national MP and demand; demand that they support free education in the 2012 budget. "And they should make it clear if their MP does not support free education, he will be thrown out of office at the 2012 elections and replaced with someone who will." He said if the people spoke with one voice, politicians would have no choice but to finally become the servants of the people instead of being the masters. THE cocoa pod borer and the Bogia coconut syndrome have struck Madang, threatening efforts by the Kokonas Industri Koporesen (KIK) and the Cocoa and Coconut Institute (CCI) for the province to be the leading cocoa and coconut exporters, The National reports. KIK and CCI chairman Sir Makena Geno last week told of the re-emergence of the diseases on Karkar and the other five districts. Sir Makena was in the province for the launch of the cocoa coconut improvement project and the presentation of five sawmills to five vocational schools – Karkar, Danip, Talidik, Ramu and Simbai. He said the two diseases would be destructive if serious networking between educational institutions, business houses, civil society organisations, non-governmental organisations and stakeholders did not exist. Extending an invitation for these bodies to join in the fight, Sir Arnold Amet gave K1.32 million for the provision of 2,000,000 cocoa trees and 100,000 coconut trees to be provided by CCI and KIK under a memorandum of agreement signed that day. Sir Makeno, in accepting the K500,000 cheque for seedlings and nursery materials to be provided with technical expertise for interested farmers in the six districts, said these two pressing issues would now be their main focus. He said his area of concern would be to eradicate these diseases before “it kills the industry as well as the growers’ interest”. Of the money, K250,000 will be for a coconut mill at Murunas; K500,000 for cocoa seeds; K125,000 each for the two new 10-seater vehicles, one for the police and the other for monitoring the projects by the provincial government. Through this MoA, the Madang government aims to raise an annual export of K16 million, at K8,000 per tonne with a target population of 48,000 people to be impacted by the cocoa and coconut improvement programme. He said K820,000 had been spent to get the five sawmills to be set up at the vocational schools with training to be provided for locals under the technical vocational education training. 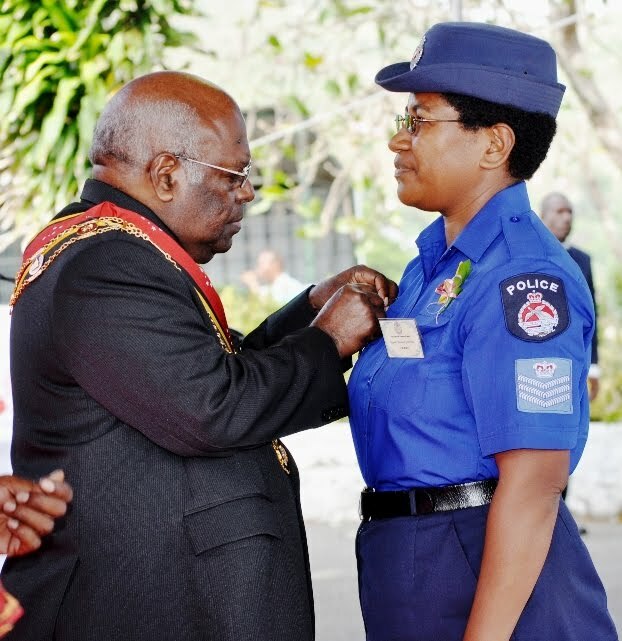 Policewoman Maureen Undaba was among more than 100 people recognised for their services to Papua New Guinea at this year's Order of the PNG New Year awards investiture ceremony held at Government House yesterday, The National reports. It was also Governor-General Sir Michael Ogio's first official investiture engage ment since he was sworn into office. Undaba was recognised for her services to law and justice. Former Catholic archbishop of Port Moresby Sir Brian Barnes, former politician Sir Akepa Miakwe from Unggai-Bena in Eastern Highlands and Madang businessman and former politician Sir Peter Barter were also among those awarded. CANADA's Nautilus Minerals intends to raise US$153.2 million for its deep-water polymetallic mining operation for its Solwara-1 project in the Bismarck Sea through a public offering of shares, The National reports. The planned offering would be conducted through a syndicate of underwriters led by TD Securities Inc and Credit Cuisse Securities Inc, Nautilus said. The company said proceeds from the offering would be used to fund the development of the Solwara-1 copper-gold project. Proceeds would also be used to fund the company's equity contribution associated with the production-support vessel joint venture agreement, and for general working purposes, Nautilus said. The offering is expected to raise gross proceeds of approximately C$150 million. The company also will grant the underwriters an over-allotment option to purchase up to that number of additional common shares equal to 15% of the common shares sold pursuant to the offering. The option will be exercisable for a period of 30 days following closing of the offer. agreement and for general corporate purposes. Final pricing of the offering will be determined in the context of the market prior to the filing of the final short form prospectus. Nautilus said the common shares would be offered in all provinces of Canada except Quebec by way of a short form prospectus and other jurisdictions outside of Canada pursuant to applicable private placement exemptions. PARLIAMENT was yesterday asked to declare that there are no public accounts for 2007, The National reports. The parliamentary Public Accounts Committee (PAC) made the recommendation after it found that the records of financial receipts and expenditures for that year were "unreliable, incomplete and not based on proper records or accounts". This state of collapse persisted across the entire public sector in 2008 and, despite slight improvements in 2009, the condition persisted last year and in the first four months this year, the PAC reported. The three reports tabled yesterday, covering 2007, 2008 and 2009, were scathing and pointed. No department, provincial government and national agency or entity was spared. Treasury and Finance Minister Peter O'Neill described the reports as "embarrassing". O'Neill said this after PAC chairman Martin Aini presented the reports. "It is quite embarrassing. We all know of the systematic breakdown in the public service and it is a matter that the government is addressing," O'Neill said. "We will take the PAC recommendations very seriously and we will deal with certain officers implicated in the report." The following was typical language throughout the reports tabled yesterday: "Corporate governance remains poor, internal controls are weak or non-existent, accounting is poor or failed, financial statements remain unavailable, accountability and transparency are poor, reconciliation of internal finances is poor or non-existent and staff competence and resourcing of a majority of entities is inadequate. "The situation with trust accounts is no better. "By 2007, the public service had illegally assumed unfettered power and discretion over the use and application of trust monies regardless of appropriations in many instances." It had become so that parliament had been asked to exert its authority over the entire public sector to return fiscal discipline and accountability by censuring departmental heads, chief accounting officers and to dissolve and restructure the entire Department of Finance. Presenting the reports, Aini said: "The committee rejects the public accounts of PNG for the financial year 2007 as unreliable, incomplete, misleading, untimely and of limited value to users. "This is a serious finding and one that requires immediate address by parliament." The auditor-general, whose constitutional role was to inquire into and report on all public accounts, had disclaimed the public accounts for the same year. *Heads of departments and senior public servants were untrained, ignorant of their duties and were incompetent and in many cases immune to the operation of the law. This indictment on public accounts and records on the handling of money continued into 2008 where, in addition to national departments, provincial governments and local level governments, hospital boards' business arms and statutory corporations and all provincial authorities were also found to be non-existent and unreliable and incomplete. This state of affairs pervaded at the district level where the government's popular district services improvement programme (DSIP) funds had been distributed. The PAC reported "slight improvement" in the making, keeping and submission of accounts in 2009 but, for the most part, the overall management and recording of transactions with public monies, property and stores "remain poor and failed in many cases". Asset lists did not exist so it was difficult to keep track of what was owned by the state. Aini said: "These failures have resulted in deteriorating services to our people and a failed system of delivering development to our citizens. "These failings continue to the present time, unaddressed. "The committee has tabled 20 reports to this house with similar findings and detailed recommendations, yet, they have not been debated or considered." TREASURY and Finance Minister Peter O'Neill described the parliamentary Public Accounts Committee report to parliament yesterday as "embarrassing", The National reports. O'Neill said this after PAC chairman Martin Aini presented its report. He said the national government was updating the public government accounting system, had transferred all trust accounts back to the Central Bank and was strengthening the internal audit for checks and balances. O'Neill said the report cited serious cases of mismanagement and clear breaches of the Public Finance (Management) Act. "This government is taking pro-active action and we will take all the recommendations and address them one by one," O'Neill said. PARENTS can now breathe a sigh of relief after Education Minister James Marape announced the national government's intention to pay the first six months of school fees for students attending primary schools next year, The National reports. Marape said during question time in parliament that it was the current government's policy on school fee subsidy beginning with free education for elementary schools from 2008 up to now. "This year, the national government allocated K178 million for school fee subsidy which is in line with the government policy to give 100% access to basic education." Marape said the policy towards 2013 was 100% school fee subsidy for elementary to primary schools. "One of the fundamental reasons parents are not sending their children to school is school fees and this will complement the universal basic education policy." Marape said the national government was responsible to help parents with school fees. "By next year, the first half of the primary school year will be free," Marape said. He said this in response to Enga Governor Peter Ipatas who said to succeed any nation must develop its human resources. "The national government has rightly put resources into the education sector ... we must not compromise quality education for our children." Ipatas said in Enga the provincial government had subsidised education for the past 12 years. He commended the minister for his initiative but asked that the national government subsidy for elementary be worked out between the province and the department to ensure "there are no conflicting policies". Marape said if there were parallel programmes in provinces "resources can be shifted to focus on school materials, infrastructure and library books". High prices and increased coffee production: double blessing or double trouble? This year the coffee industry is doubly blessed with a 14-year high coffee price and a huge crop never seen for many years. These blessings are literally very good for the multitude of the coffee growers and many small village-based ground buyers. Many of them have never ever held in their hands a thousand Kina at any one time in their lives. This year, once in their lifetime they are able to hold a thousand kina. What they do with such volume of cash is none of my business but it would be good for them to use wisely to improve their lives, solve many of their daily problems and social obligations, then, save some for the future. But as is always the case during coffee season, many will turn to squander coffee money on alcohol and gambling. With these will come many social and community problems and thus, left with nothing to show by the end of the coffee season. On the other hand, this dual blessing is already turning into nightmare for the middlemen who are the big coffee buyers: the processors and the exporters. To them, these blessings are in fact curses. Prices are more than twice that paid for a kilo of coffee around this time of the year in 2010. One has to spend more than twice the amount to buy same quantity of coffee. Already the increase in coffee production this year is putting a lot of pressure on the availability of funds and the processing capacities of many processing mills. Banks in Goroka, Kundiawa and Mt. Hagen are running out of liquid cash very quickly and the risks involved in moving huge amount of hard cash around is costing more money too. These are readily transferred as added cost to the coffee stakeholders. Not only are those, the banks already putting minimum limits to how much each client can withdraw at any one time. This too is having a negative effect going down to the growers. Processors and buyers cannot get enough to do business resulting in many issuing credit receipts. All these combined to make doing business in coffee very difficult for the coffee buyers and processors. Then again, there are big volume buyers who depend on stand-alone coffee processing facilities to process their parchment coffee into green beans for sale. This lot of operators depends on each other for mutual benefit in the industry but many of these facilities have old processing machineries that cannot service everyone properly and on time. These machineries are working full steam non-stop seven days a week and are due to burst anytime. The cue is very long and valuable time is wasted. The buyers are under pressure to deliver coffee to exporters from whom they got cash advances to buy coffee. The multi-national coffee exporters are and have been acting as the banks for the coffee industry. They in turn are faced with the mammoth task of forking out more than twice the amount of money into the industry this year. They too are already feeling the pressure. This year sees the demise of national aspiration for localising coffee export. The national coffee export companies are finding it extremely difficult to trade and few successful medium-sized exporters are already foregoing export and are selling locally to the big multinationals. This in fact is a step backwards and signals a very sad turning point in the life of the coffee industry. Papua New Guinean companies are finding the going very tough and cannot maintain the pace year in year out anymore without government and the bank support. Such financial and management problems in companies only become very obvious during such a time of high prices and bumper crop. Coffee processing capacity of the industry is now being tested. Enga, Western Highlands, Southern Highlands, Chimbu, Morobe and Madang do not have the capacity to process their respective production, while Eastern Highlands has, but the fact is in coffee business most of unprocessed coffee from these provinces are brought into Goroka and Kainantu to be sold. These are already putting excessive pressure on the number of coffee processing facilities in Eastern Highlands. We have a big quality problem waiting to happen. If it does, it will kill many businesses and destroy PNG's high standing on the world coffee market. The danger of the highly distasteful chemical taint (Rio Flavor) reoccurrence this coffee season can not be ruled out in coffees from those areas known to have these problems before. Here, Coffee Industry Corporation (CIC) must be very vigilant in, to ensure that its quality laws are adhered to by the licensees and the coffee buyers and processors. (3) We will lose many good buyers who will be very difficult to get back later. The industry should be concerned that the highly-sophisticated chemical analysis laboratory funded by European Union and built in Lae in early 2000 for the purpose of carrying out analysis and research on the chemical taint in coffee has gone to the rats, so to speak, and are now of no value. This asset belongs to the stakeholders, therefore, the facilities must be brought back to function and be put to use as safeguard against this potential quality threat by Rio Flavor. Finally, companies and businesses involved in coffee that are not careful in their activities will find out by the end of the year that they made huge loses instead of profit. The danger is great and it is in one's interest to take measures to ensure that sound business decisions and acceptable industry quality practices are employed from the outset to protect themselves to make profit and in doing so also play a responsible role in protecting our industry as a whole against such problems and we can continue to enjoy the high prices that will remain for a long time yet.